Everton´s miserable run without a win at Anfield since 1999 continued after a tame 220th Merseyside derby ended with a 0-0 draw. 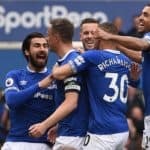 Sylvain Distin scored to put Everton ahead, heading in Leighton Baines´ cross 11 minutes into the second period but referee Michael Oliver ineptly decided Victor Anichebe had fouled Pepe Reina – an incorrect decision, a decision met with widespread criticism. 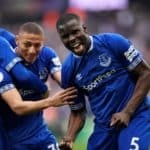 The draw leaves Everton´s European aspirations in tatters, sitting in sixth place, five points behind Tottenham, who are occupying the Europa League qualifying place, with two games left for Moyes´s team and three for Spurs.